Making Life Easier Since 2007! 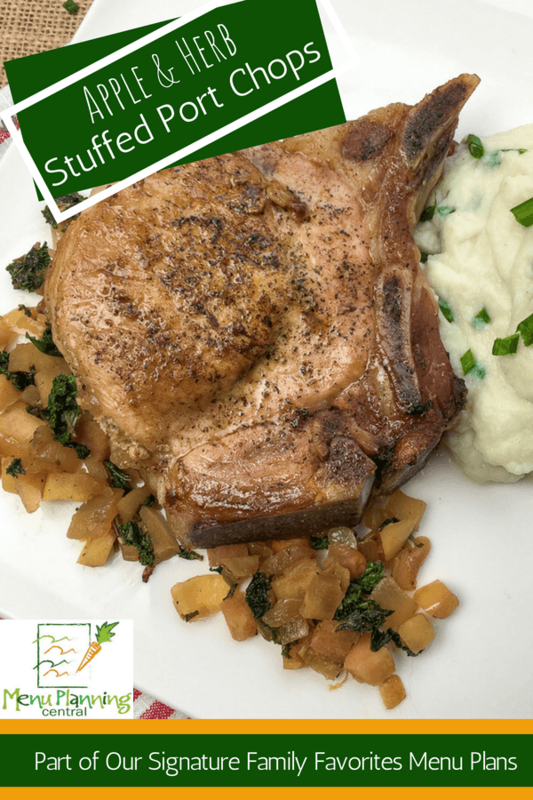 This easy apple stuffed pork chop recipe is a delicious and healthy meal your whole family will love! 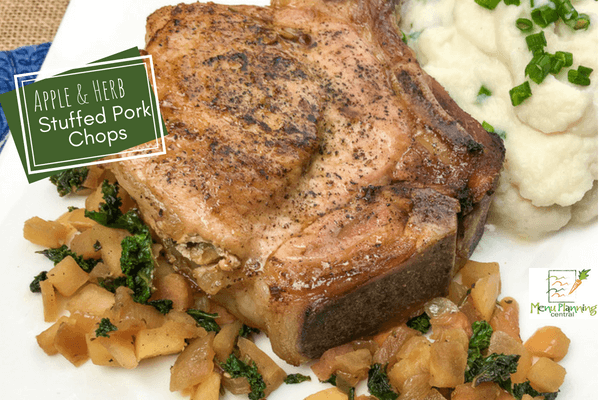 Each and every bite of these delicious apple stuffed pork chops is loaded with incredible flavor. The fresh rosemary and lemon zest lend a light citrus nuance, while the apple and cinnamon add a depth of warmth to this dish. These easy apple stuffed pork chops are an enjoyable and healthy meal your whole family will request over and over again. 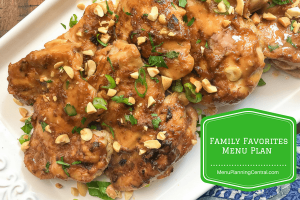 This easy and delicious recipe is part of our Family Friendly Menu Plans. Place top oven rack in center position and pre-heat oven to 375°F. Heat one tablespoon olive oil in a large, ovenproof skillet or sauté pan over medium-high heat. Add diced onion and garlic and cook, stirring occasionally, until the onion is soft and fragrant, around 4-5 minutes. Reduce heat to medium and add another tablespoon of olive oil. Add the kale, apple, cinnamon, lemon zest, and fresh rosemary to skillet and cook, stirring occasionally, until the apple is soft and the kale is just wilted, approximately 3-4 minutes. Season with salt and black pepper, to taste, and stir to combine. Remove from heat and transfer apple mixture to a medium-sized bowl and set aside. With a sharp knife, carefully make a slit through the center of each pork chop to form a pocket. Do not cut all the way through. Divide the apple-rosemary filling between the 4 pork chops and secure the openings with toothpicks to hold the stuffing inside. Return the skillet to medium-high heat and add remaining olive oil. Sear the pork chops on both sides until golden brown, around 3-4 minutes per side. Season with additional salt and black pepper, if desired. 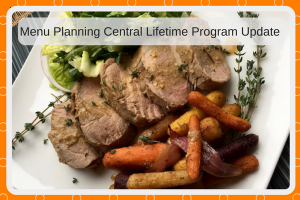 Transfer the skillet with the pork chops to the pre-heated oven and roast until the pork chops are cooked through, around 15-20 minutes or until an instant read thermometer (aff.link) inserted in the center reads 145°F. Allow pork chops to rest for 3-5 minutes before serving with your favorite side dish. Enjoy! 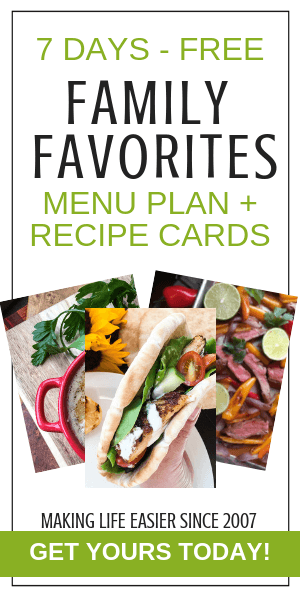 Know Someone Who Might Like This Recipe? Check out Our Popular “Refer A Friend” Program Here!